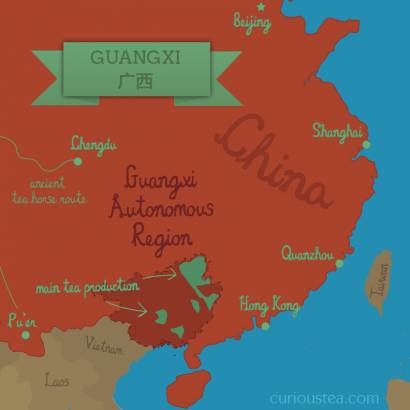 Welcome to the July 2018 edition of the Curious Tea subscription! Let’s look at the four exciting new teas we’re sharing with our subscribers this month. 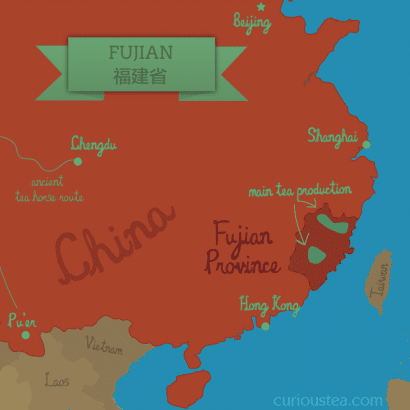 This month our journey takes us to Fujian and Yunnan in China and to Darjeeling. The first light tea this month is Feng Yan Jasmine Phoenix Eyes from Fuding in Fujian Province, a soft and delicate jasmine scented green tea. The second light tea is a light oolong tea from Anxi in Fujian Province, Huang Jin Gui Golden Osmanthus Oolong, a particularly floral tea with a fragrance reminiscent of sweet osmanthus blossom. For the dark side of the selection we have a classic First Flush Darjeeling 2018 from Phoobsering Tea Estate. 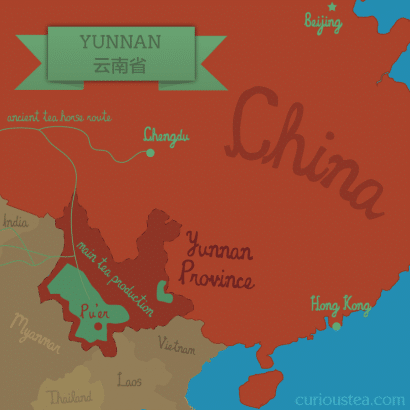 And we are also featuring a Dian Hong from Wu Liang Mountain, which is an unusual, flavoursome Yunnan red tea that undergoes brief fermentation prior to being oxidised to make a black tea. Mixed: Feng Yan Jasmine Phoenix Eyes and Darjeeling Phoobsering First Flush 2018. Let’s get into further detail on the products featured in our July tea subscription boxes. Feng Yan Jasmine Phoenix Eyes (茉莉鳳眼) is an organic jasmine green tea that is grown in Fuding, Fujian Province and then scented and finished in Guangxi Province of China. The name of this tea, which translates from the Chinese Mo Li Feng Yan as Jasmine Phoenix Eyes, comes from the shape of the dried leaves that resembles an eye of a phoenix. This tea produces a soft cup that is balanced and smooth, having a delightful jasmine aroma and taste. It comes from the Spring 2017 harvest. The production process follows a classic jasmine green tea recipe of scenting tea leaves with jasmine blossoms. The plucked leaves of this tea are rolled into a distinctive phoenix eye shape during processing and prior to scenting. The scenting involves layering tea leaves with fresh jasmine blossom in alternating layers so that the leaves acquire a jasmine fragrance. The blossoms are removed from the finished tea as leaving the jasmine blossom in can deteriorate the quality of the tea and result in a bitter taste. Jasmine tea is very popular in China and is often used as a welcoming gesture to guests. Feng Yan Jasmine Phoenix Eyes green tea comes in tightly rolled leaves in a distinctive eye shape. The dry leaves have a delightful jasmine aroma. When you brew this tea, the rolled leaves will slowly unfurl. They will not fully unfurl on the first infusion, meaning there is quite a lot of flavour left over for subsequent steeps. The jasmine aroma is stronger on the first infusion, becoming gentler with further brewing. The golden liquor has a character that is floral, verdant, quite light and very smooth. It produces quite a gentle jasmine green tea that is balanced and soft. There is no dryness or astringency on the aftertaste, instead it is juicy and has a long lasting jasmine flavour. It is less complex than our award-winning Nu Er Huan Jasmine Girl Rings yet the flavour is more subtle. Perfect if you prefer a lighter jasmine green tea. We suggest brewing parameters of 80°C for 2-3 minutes according to your taste. It can be brewed 3 or more times depending on your taste preference. 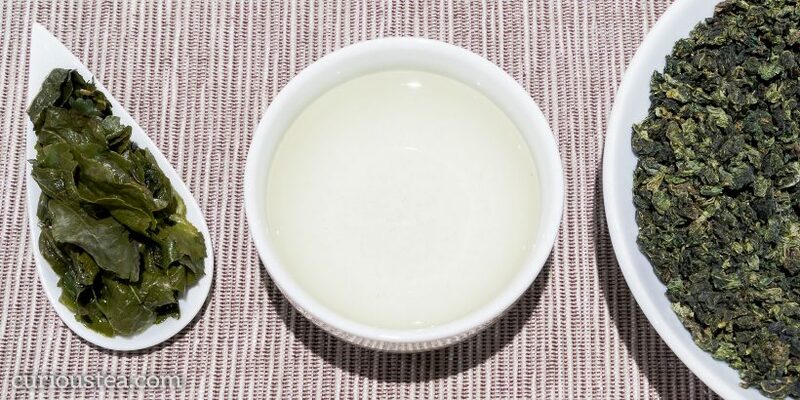 This Feng Yan Jasmine Phoenix Eyes green tea produces a very satisfying cup of tea that is pleasant to drink on its own or it also goes exceptionally well with most types of food. You can also buy Feng Yan Jasmine Phoenix Eyes green tea in our online shop. Huang Jin Gui Golden Osmanthus Oolong (黃金桂烏龍茶) is one of the four famous lightly oxidised oolongs from Anxi County of Fujian Province in China. It is one of the most floral oolong teas from the area, having a verdant and floral character reminiscent of sweet osmanthus blossom. This particular batch is from the autumn 2017 harvest. Huang Jin Gui (黃金桂), which translates as “golden osmanthus”, gets its name from the floral character that is said to resemble the scent of sweet osmanthus flowers. This oolong should not be confused with other teas that are actually scented with osmanthus flowers. This tea, while being quite floral, is unscented. The floral profile only hints at osmanthus blossom fragrance. 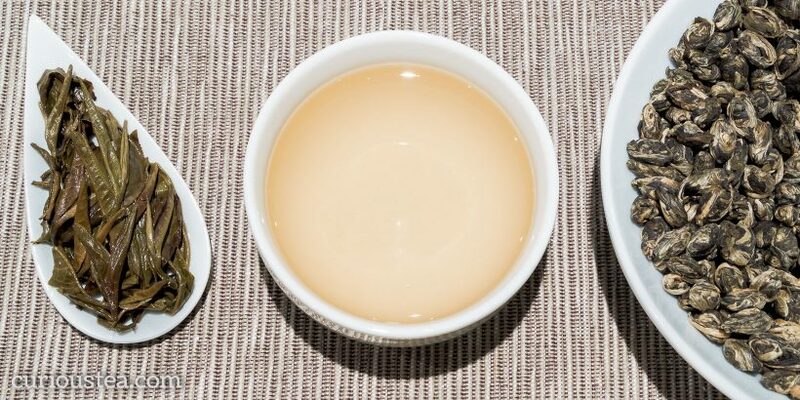 Anxi style oolongs are generally lightly oxidised, retaining many of the delicate floral aspects that are closer to a light green tea without the grassiness or astringency. This type of oolong has become known as a ‘jade’ or ‘green’ oolong due to the light appearance and colour that is reflected in both the leaves of the tea as well as the light coloured liquor. Traditionally, many Anxi oolongs, while being lightly oxidised, would undergo heavy roasting to produce a much stronger roasted profile. 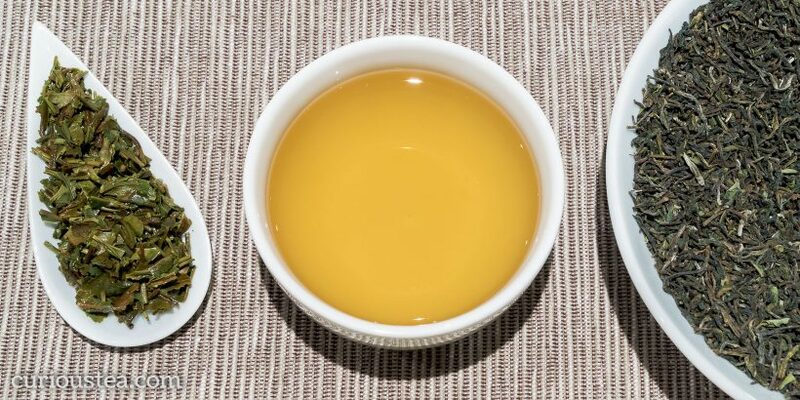 These traditional roasted oolongs have fallen out of favour as there has been a rise in popularity of the unroasted light green oolongs both in China and in the West. In large part this is driven by trends among the younger generations in China. Also these lighter oolongs tend to be much easier to brew while having a much more easily approachable and appreciable taste. They are comparable to the lightly oxidised oolongs of Taiwan, such as Jade and Four Seasons, which are also gaining in popularity. Huang Jin Gui Golden Osmanthus Oolong has a low degree of oxidation, resulting in a light liquor with a brilliant floral profile. The dark and light green coloured rolled leaves open up when brewed to produce a light yellow coloured liquor. True to the name of this tea, it has a wonderfully floral and verdant aroma reminiscent of osmanthus blossom. It has a lovely character that is light and super smooth, without any astringency. The flavours have sweet buttery notes of verdant florals and asparagus. It has a fresh and clean aftertaste with just a touch of tartness. A refreshing tea that is great for working and focus. We suggest brewing at 90°C for around 3 minutes according to your taste. It can be brewed around 3+ times depending on your taste preferences. You can discover all four famous Anxi oolongs in our online shop: classic Tie Guan Yin Iron Goddess of Mercy, crisp and zesty Mao Xie Hairy Crab, refreshingly floral Ben Shan Source Mountain and the most floral Huang Jin Gui Golden Osmanthus. Darjeeling Phoobsering First Flush 2018 is a high grade (FTGFOP1) First Flush Darjeeling tea that has an elegant and balanced profile. 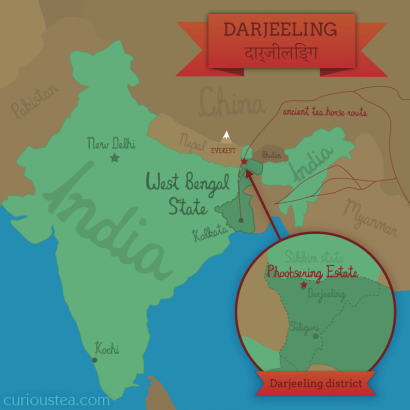 It is an excellent Darjeeling, full of first flush character with floral and mineral notes from the 2018 spring crop grown and processed to organic standards by Phoobsering Tea Estate. Phoobsering Tea Estate is one of the oldest plantations in the West Valley of Darjeeling District, right next to the town of Darjeeling. Interestingly, and somewhat unusually, the tea estate is named after a local person, the first supervisor of the estate called Phoob Tshering. There is no explanation why the tea estate was named after a local and it presents an intriguing mystery. The tea garden is located at an elevation of between 1,000 and 1,800m and produces some world-renowned first flush teas. This Darjeeling Phoobsering First Flush, plucked in spring 2018, has neat small leaves with muted dark green colours as well as silver tips. Once brewed, this tea produces a bright golden liquor with a pronounced first flush character and a mineral, muscatel aroma. It is a very fine and balanced tea, producing a complex liquor with unique flavours. The rounded profile is mineral and chalky, with muscatel and floral notes. There are notes of menthol and citrus that make this tea particularly exciting and make it stand out amongst other First Flush Darjeeling teas. The aftertaste is long lasting and is floral and mineral. This tea will pair well with sweets so will make an excellent choice for a complex yet satisfying cup of afternoon tea. Darjeeling Phoobsering First Flush 2018 black tea is best brewed at 90°C for 3-4 minutes according to your taste. It can also stand at least one more infusion. Best taken without milk to fully enjoy the first flush character and complexity of flavours of this fine tea. You can also buy Darjeeling Phoobsering First Flush 2018 black tea in our online shop. Dian Hong Wu Liang Mountain (滇紅無量山) is a lovely Dian Hong, or Yunnan Red from Wu Liang Shan (Boundless Mountain) located in Simao District of Pu’er Prefecture in Yunnan Province of China. Grown at a very high altitude of around 2,300m this black tea unusually undergoes a brief fermentation before being processed into a black tea. The fermentation aspect adds an intriguing and appealing dimension to this tea that is quite unique among black teas from Yunnan. This crop of Dian Hong Wu Liang Mountain is from the spring 2017 harvest. Simao District has played an important role in history of tea, both in this region and in the rest of the world. The ancient Tea Horse Road was a trade route with the starting point in Simao, so both this district and the surrounding Pu’er Prefecture area have been growing and trading tea for over a thousand years. To this day tea remains the central crop and production of this region. The wiry golden leaves of this Dian Hong Wu Liang Mountain black tea produce a dark amber liquor with a malty aroma. 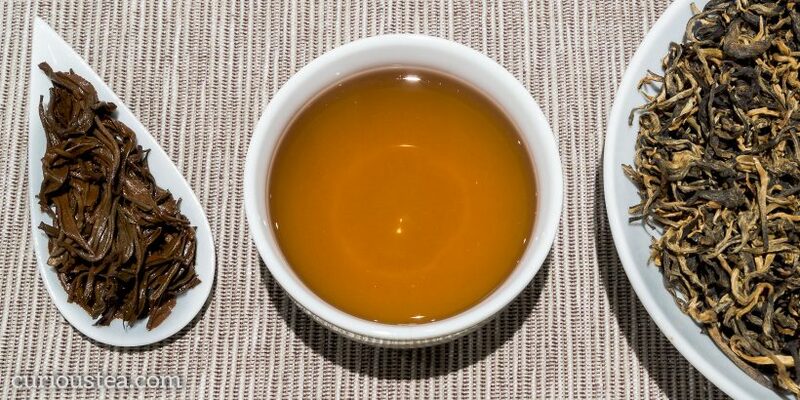 The taste is refreshing, with sweet and light malty notes that Dian Hong teas are famous for. The brief fermentation somewhat dulls the maltiness, resulting in a liquor that has a fresh, slightly thin and not very long lasting aftertaste. There are dry stony and fruity notes and some floral cocoa notes on the aftertaste. It makes for a very easy to drink cup of medium black tea that is perfect without milk or sugar. It is particularly suitable for pairing with cakes, pastries and other sweets. We suggest brewing this Dian Hong Wu Liang Mountain black tea at 90°C for 3-4 minutes according to your taste. It can be brewed around 3 times depending on your taste preferences. You can also buy Dian Hong Wu Liang Mountain black tea in our online shop. We really do hope that you enjoy the tea selection for July and are looking forward to the next instalment in August!